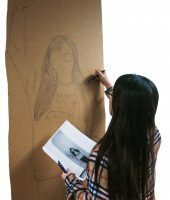 HANDS UP—Kiki Leung sketches out her cardboard cutout for Environmental Design 101. Architecture students began constructing life-size cardboard cutouts of themselves at the E-7 building Monday for their Environmental Design 101 course at ELAC. According to Gregory Kachoeff, Instructional Assistant and Lab Tech for the Department of Architecture, this project teaches students drawing skills, the proportion of body to space, deadlines and teamwork. Kachoeff said that if one student is better at drawing and another is better at construction, often students will help each other out. “A bit of competition drives people,” said Kachoeff. Michael Ho, student working on the project, said that he appreciates all the team work. “Everyone just helps each other. You get ideas from each other and correct yourself,” said Ho. “The shoes are the hardest,” said student Dominique De Alba, who was on the floor of the E-7 hallway redrawing the shoes on her project. “Everybody’s been making changes.” The students begin the project by creating a smaller version using paper. Students have a full-body photo taken of them, then they draw a grid and the proportions are enlarged to a 3” x 3” grid on a large piece of cardboard. Kachoeff shared a story about a student who accidentally made a 6” x 6” grid, which resulted in the finished piece to be two-thirds larger than the student’s actual sign. “It was funny to see, she was massive,” Kachoeff said. Students are graded on accuracy and the soundness of its structure. To get a passing grade, their structure has to stand for a week without any flopping parts. “It’s something practical. I can learn something real from this subject,” Zixuan Sandy Liu said. Liu is taking the Environmental Design 101 class to transfer to UCLA. “I’ve learned how we can use scale to design something and make it suitable for human beings,” Liu said. Once students finish thie assignment, their next project is to figure out how the body moves through space. “Students must choose a daily activity and then they have to break down the activity,” Kachoeff said. “Whether it’s a dance move, or biking at the beach– they take their body proportions and they break it into cubes. You really have to get analytical about the whole movement. Then they connect all the boxes by how the actual movement works,” Kachoeff said. The students’ anthropometric projects will be on display on the first floor of the E-7 building.